Park on the runway – it’s ok, no planes tonight. When you’re driving around with dogs you need to stop every few hours and let them out for a stretch, a snack and to take a pee. We call it dropping dogs. The mutts quickly get used to a routine of travel and so do the people. 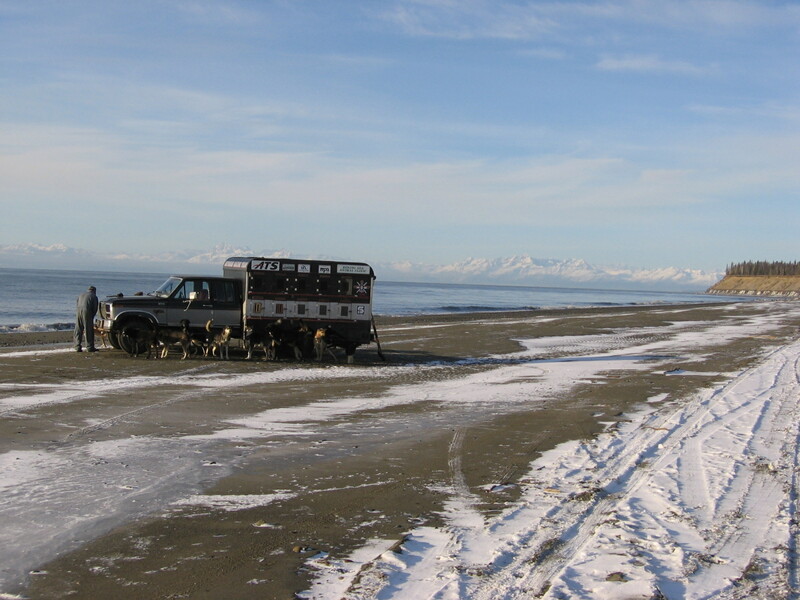 Before we left for Talkeetna we decided to head for the ocean and dropped dogs on the shores of Cook Inlet. By Cook Inlet. And the dogs weren’t the only ones who had to pee….sorry Darrel. Before I get any further, some folks may be wondering exactly how this dog truck thing works where the furry members are concerned. The dog box is just that – a big box with several smaller boxes. Most mushers will line them with straw while others may use wood chips or blankets. We like straw because it is warm and smells good – unlike the dogs and yes, sometimes us. The boxes hold two dogs comfortably although we do have a few 90 lb plus dogs who end up single and on the bottom. Ever try to lift a 90 lb wriggling mass of fur over your head? All of our dogs but one like the dog truck. For them it signals new adventures. Our one hold out is a monster at 130 lbs and I think he had some bad experiences before coming to us. On our most recent trip in late March he was less reluctant to hop into the box. Sometimes a musher just needs to figure out what works best for the dog. Here’s a better view of Betsy Ford and the dogs during a drop. 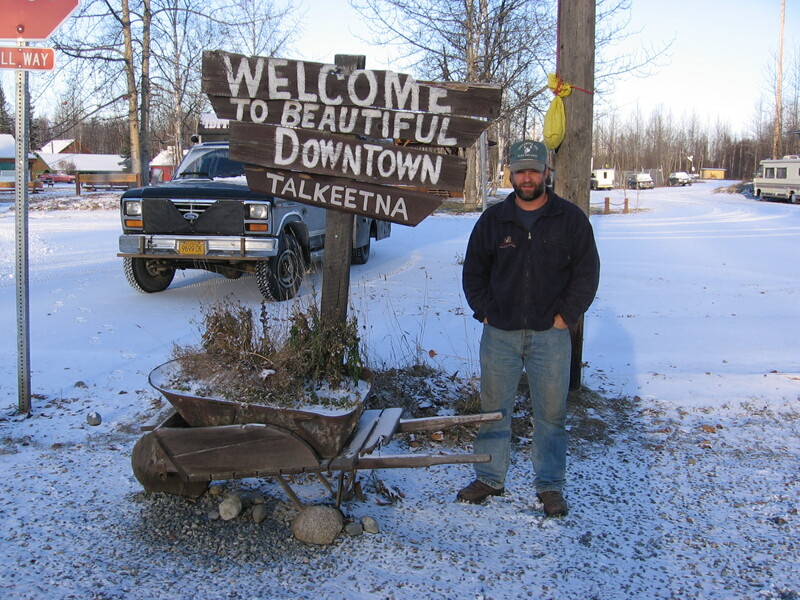 We pulled into Talkeetna around supper time. The center of any small town or village is the local store. Flyers are tacked haphazardly on cork boards in the entryway announcing spaghetti feeds, AA meetings, church picnics and the sale of just about everything from beaver carcasses to the crap someone’s “no good ex-husband” left behind. This is the sign which welcomes you to their fair town. It’s an awesome reflection of the people. In addition to the store keeper there were 4 or 5 locals in there that early evening. I grabbed some munchies while Darrel asked if there was any place we could stake out dogs and find a place to sleep. Well that started a litany of helpful suggestions. Somebody had a friend of a friend who used to be a musher and would probably have space and a bed. There was that deserted camp at the end of the road. But the suggestion award went to the fella who told us we could stake the dogs out on the runway. He was adamant there would be no planes coming in that night but, he added after a pause, if the runway lights did come on we’d better get the heck out of there. Comforting. In the end we slept in the truck at the abandoned camp. It was cold (about 5 degrees) and uncomfortable – so in other words a typical night. The next morning we treated ourselves to breakfast at the local cafe. Having eaten in restaurants most of us are used to sitting at a table with friends or family – you know, the people you went into the eatery with in the first place. For those of you planning on visiting small town Alaska you had better set aside those expectations. We went inside the restaurant and were greeted by a myriad of tables pushed together to seat groups of 8 or larger. Apparently everyone in Talkeetna likes to eat with everyone else. The place was hopping busy and we joined a group of 12 or so folks – none of whom knew each other. But after several cups of coffee and stuffing ourselves with delicious food we seemed to all be friends. What a great way to meet people! 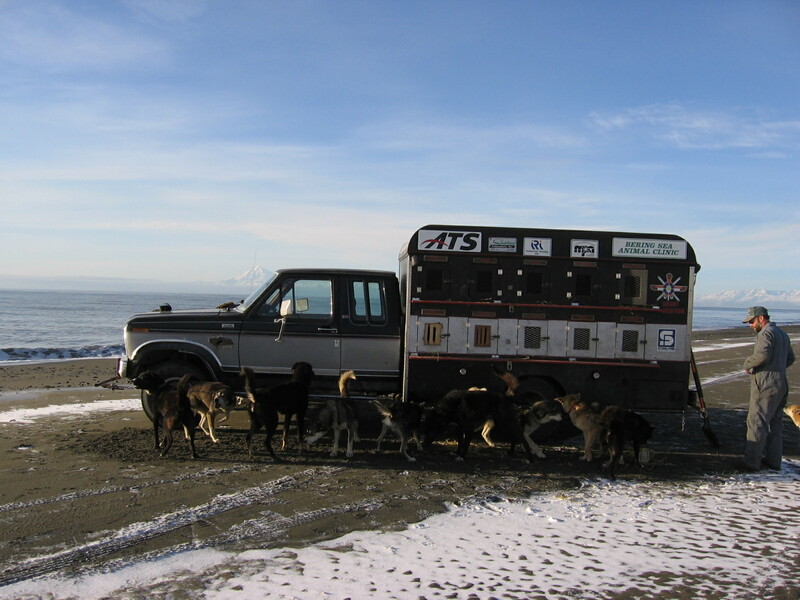 Darrel and I wanted to check out the mushing community of Willow, further south down the Parks Highway so we reluctantly left our new friends and headed for the truck parked right outside. Well Betsy Ford, like any old truck, has a few quirks. One of the less endearing ones is that if she isn’t parked on a slight downhill an air bubble develops in the fuel line. If you don’t fire her up on the first try then you get to bleed the injectors – a bit of a time consuming process. And yup, you guessed it. Darrel broke out the wrenches. It’s a bit humbling given the fact that our truck says Iditarod Racing Team on it which leads people to think that we know what we’re doing. For the record the truck was purchased from an Iditarod musher and since Darrel would like to do that race we just left the tag on there. After much coaxing Betsy finally cooperated and we were on our way. Next stop – Willow, Alaska.